Only a few days after the annual 4th-of-July festival brought thousands of people to celebrate American independence in the streets of Philadelphia, the city hosted a different kind of gathering. 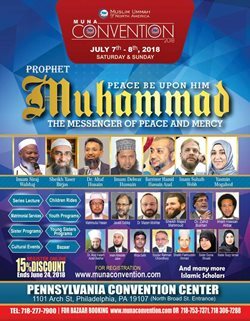 The Muslim Ummah of North America (MUNA), an organization with deep ties to the south Asian extremist group Jamaat e Islami (JI), chose the City of Brotherly Love as the venue for its annual Islamist convention. 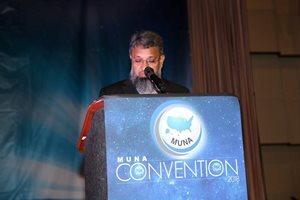 Over the weekend of July 7 and 8th, a number of fanatical speakers addressed the MUNA conference in America's birthplace. Worse still, this conference took place with the endorsement of local politicians. Incorporated in New York in 1990, MUNA professes to be a benign non-profit group devoted to "social service" and developing the "personal, moral and social quality of human life." Yet MUNA officials and the guests at its events including prominent supporters of JI, a violent South Asian Islamist movement founded in India by the Islamist theorist Abul Ala Maududi, whose ideasabout Islamist conquest helped shape the development of groups like the Taliban and Al-Qaeda. Although JI is not itself a banned organization in America, in August 2017, the U.S. government designated Hizbul Mujahideen – JI's paramilitary wing in Pakistan and Kashmir – as a terrorist organization. Although JI maintains branches in dozens of countries across the globe, it is perhaps best known for helping Pakistani forces commit dozens of war crimes against Bangladeshis during the 1971 independence war. In the decades since, JI has continued its practice of complicity in violence across the subcontinent. MUNA's officials are not shy about their support for JI. In 2010, MUNA organized a picnic with Muhammad Kamaruzzaman, JI's assistant secretary general, as the guest of honor. A few years later, in 2013, a Bangladeshi War Crimes Tribunal sentenced Kamaruzzaman to death for his role in the murder and torture of unarmed civilians, including the massacre of 120 unarmed farmers, during the Bangladesh Independence War. MUNA's vice national president Abul Faizullah, meanwhile, has praised Abdul Qader Mollah, another senior JI official. Mollah was also sentenced to death for crimes against humanity, which included assisting Pakistani troops with the murder of 369 people. Despite JI's violence, American politicians seemed happy to endorse MUNA and its convention. New York Congressman Hakeem Jeffries and Atlantic City (NJ) Mayor Frank M. Gilliam, Jr. both penned letters of praise for MUNA, which were published in the convention's booklet. In his letter, Congressman Jeffries applauded MUNA for "building bridges of understanding and cooperation," while Mayor Gilliam wished MUNA "all the best for [the] convention." Neither Gilliam nor Jeffries seemed troubled by MUNA's links to a genocidal Islamist movement or the convention's featured speakers, several of whom have long histories of hateful speech. For instance, MUNA's conference featured the prominent cleric Suhaib Webb, who has made many extremist statements. Webb has previously said that "the men who imitate a woman and the women who imitate the men and their dress are cursed." He has stated that he "understands" Muslims may have "animosity" towards Jews. And he has declared that the punishment for those who commit Zina [adultery or fornication] is to be stoned to death. Webb's support for theocracy seems clear. He calls secularism a "radical, lunatic ideology", mourns the "loss of holy power in politics" and rule "by divine authority," and calls for governance by "the dynamic, pluralistic, empowering Islam of the Prophet's era." Speakers from overseas were just as extreme. Bengali cleric Abul Kalam Azad Bashar uses his social media to express extremist and misogynist opinions. He describes democracy as nothing but a stepping-stone to establish absolute Islamic rule. He has described a country governed by man-made laws as a "totally sinful idea," and he praised Saudi Arabian laws that force women to be "fully covered," contrasting them with Bangladeshi women's "immodest outfits on the street [which] create a disgusting atmosphere." Zahid Bukhari, a former president of the Islamic Circle of North America (an organization also closely tied to JI), was also present. Bukhari has openly promoted Jamaat-e-Islami on his Facebook page, and has shared petitions in support of Jamil Abdullah Al-Amin, an Islamist jailed for murdering a police officer in Georgia. Bukhari has also enthusiastically eulogized Necmettin Erbakan, the late anti-Semitic Islamist former prime minister of Turkey. Bukhari described Erbakan as "a visionary and brilliant leader of Turkey's Islamist movement who devoted his entire life to creating a more peaceful and just world." With these speakers, MUNA affirms its extremist ideals. Even if MUNA had not invited such fanatic speakers to the convention, the organization has a clear history of condoning and spreading extremism, and giving platforms to hate. Why would our elected officials, whose primary responsibility is to protect and govern American democracy, involve themselves with an Islamist movement and speakers committed to replacing that democracy with violent theocracy? Though these officials may have simply been unaware of MUNA's extremist links, politicians have a clear responsibility to know what and whom exactly they are endorsing. We could once excuse these politicians' poor judgement as nothing but deep naivety. But Islamists have been operating in the streets and conference halls of Philadelphia and other cities across America for far too long. They do so with the connivance of public officials. Martha Lee is a writer for Islamist Watch, a project of the Middle East Forum.